Jineoloji is the science of women and free life. This is reflected in the term „Jineoloji“ as well. 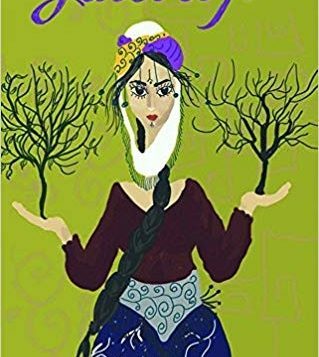 It is composed of the Kurdish word „Jin“ which means woman or life and the Greek „logos“ which means reason, speech or in broader meaning also science. 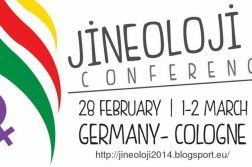 Jineoloji was started in 2012 by the Kurdish Women’s Movement. Since then it has spread to the whole world. In the Democratic Federation of Northern Syria Jineoloji has become an official part of the education system, being taught in school and at the Rojava University. Jineoloji is a new science, that criticizes the connection of hegemony, oppression and science with each other. It criticizes the hegemony of men on history. History is the base of our understanding of the present. But the history / HERstory of women has always been tried to hide and to destroy. Jineoloji therefore wants to reinterprete Mythology, Religion, Philosophy and Science. It wants to find the traces and truth of women in order to find ways for women’s liberation. Through women’s liberation it aims at the liberation of the whole society and the establishment of a free and communal life. As science, politics, ethics and many social institutions have stated, 21st century will be the century in which the woman’s freedom will triumph. This evaluation is based on the rise of women’s struggles in various geographies of the World, particularly in Kurdistan. Woman’s struggle for freedom, which has incrementally grown with great values until today, has become a main dynamic of the development of social freedom. Women’s freedom, which conditions the achievement of social freedom, has reached a potential to be able to expand more than ever. The social values that have thus been ​​created must meet a scientific expression. “The lines referring to woman in the masculine discourse, leaving its mark on social sciences like on any other scientific fields, carry propagandist approaches, which do not touch the reality at all. The true status of the woman is covered with this rhetoric, perhaps forty times, just as the histories of civilization cover up class, exploitation, oppression and torture. Instead of feminism, the concept of Jineolojî (woman’s science) can meet the purpose better (Sociology of Freedom, p.226). This conceptualisation sparked important discussions in Kurdistan Woman’s Liberation Movement. After these discussions reached a certain level, a working group that would play a fundamental role in the establishment of Jineolojî was created at the 8th congress of the Kurdistan Women’s Freedom Party (PAJK). The unit formed, firstly strived to answer the questions of ‘how the need for women’s science arises’, and ‘which needs can it meet’. The discussion process that started at the academies in the mountains of Kurdistan, gradually spread within society. Jineolojî is currently organized as committees in four parts of Kurdistan, Europe, and Russia. We believe that even this process, which is just a start in the creation of science, will cause a profound change in social sciences. We believe that the scientific evaluations that Jineolojî reaches will be a step forward in renewing the conceptual world, thus giving libertarian content to social institutions. Moreover, we believe that, with this initiative, the universal ties we have and will further establish with the women’s movements around the world will strengthen, and the grounds for discussion will grow. Jineolojî aims to create a transformation not only by altering woman’s self-definition, but also by criticising the state, power systems, their institutionalisations and the mentality formed around them. Therefore, it can play a crucial role in the establishment of democratic modernity, as an alternative to patriarchal capitalist modernity. For this reason, as Kurdistan Free Women’s Movement, we care about the establishment of Jineolojî, and we believe that we will ensure its development with our moral, political and intellectual efforts. If Jineolojî can create solutions for the problems of social life, it means that it is advancing on the correct path. Therefore, Jineolojî can preserve its claim of being a science as long as it puts on a practical level an end to the mentality and the sovereignty of patriarchal institutions that have infiltrated every moment and every field of our life. Jineolojî will create its own perspective in the core areas that are perceived as areas of crises, and will lead the way to find practical implementations and solutions for them. That is to say, it will develop science as a common wisdom, conscience and action of society without falling into scientism. Jineolojî will examine the historical developments and current situations in relation with each other to uncover the reasons for and solutions to the defeat of women in these fields. It will generate a perspective for organizing these areas with women’s efforts, ethics and aesthetics. The emerging practical outcomes will be turned into a theory that will contribute to women’s freedom. For this reason, each of the social sciences and their disciplines that fall under the scope of Jineolojî are also enormous areas of action. 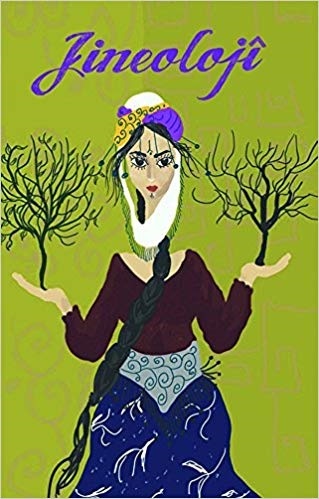 In order to make women’s presence visible within the natural society and the class-divided state civilizations, Jineolojî makes use of mythology, religion, philosophy and social sciences (mostly develops counter readings). It establishes academies for connecting the pool of knowledge gathered by women with the mentality of society, and produces institutions and living spaces that can be considered as alternative models for realizing itself according to this mental transformation. We hope it awakens in you the same feeling born from challenging our thought processes and boundaries. If it happens, it means that we are on the right track because Jineolojî means a radical objection to the existing mental structures. Jineolojî will change society to the extent that our objections are acknowledged. It will flow in the women’s world just like a river finding its streaming channel. Thus, it will develop a profound solution to social crises. Women’s hope for future, which relies upon their conscience about themselves, will grow with Jineolojî.